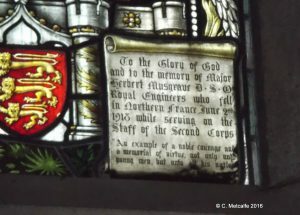 This article highlights 4 memorials in St Swithun’s church with military connections. At Bombay, April 9 1895, aged 22 years. At the top is the shield from the Musgrave coat of arms. At the bottom is a regimental symbol. 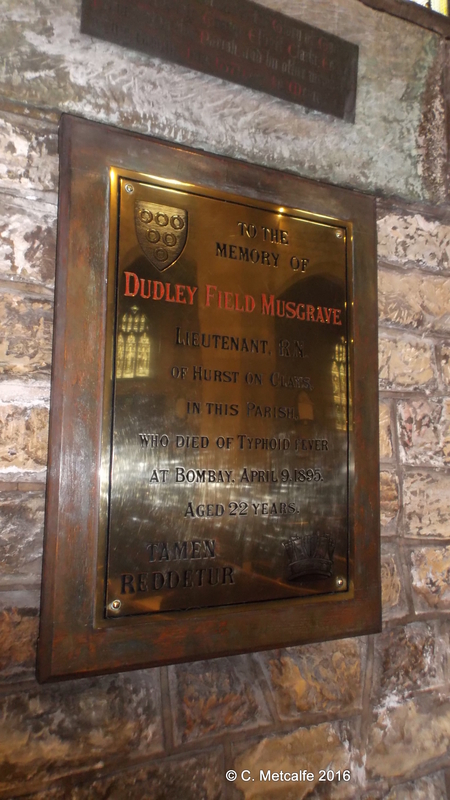 Another member of the Musgrave family was killed in the Great War. Both of the windows with knight figures in the stained glass in the Memorial Chapel were given by the Musgrave family. ‘An example of a noble courage and a memorial to virtue, not only unto young men but unto all his nation’. 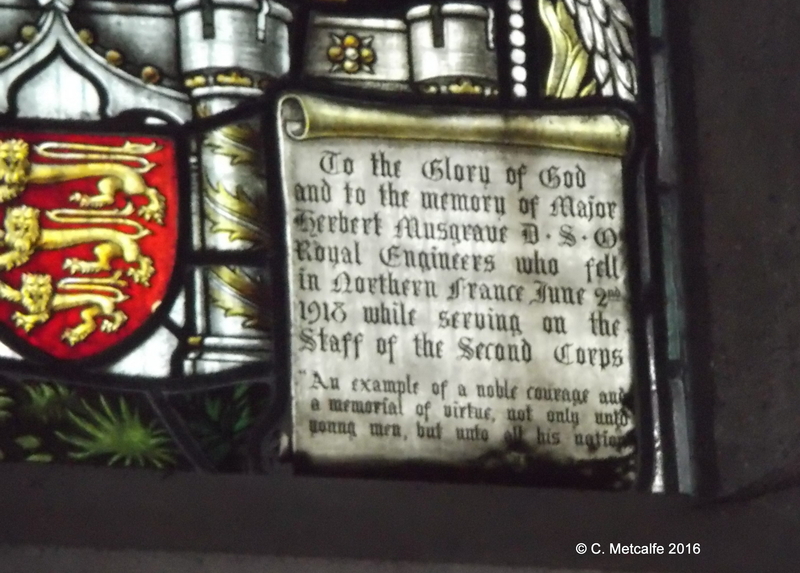 It was clearly important for this grieving family that their 21 year old son, a son of East Grinstead, should be remembered and that his name should live on, through being displayed in church. 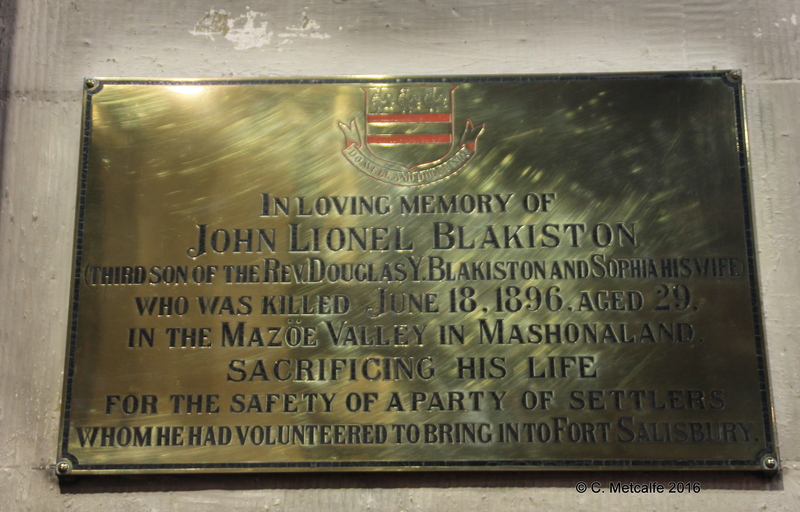 Douglas Blakiston was Vicar of St Swithun’s from 1871-1908. He had 4 sons and 2 daughters. Blakiston lost 3 sons: Charles died in a firearms accident aged 24 in 1887; William fell under a train and died a few days later in 1889. John was a telegraph clerk among those killed while defending Mazowe, Zimbabwe- formerly Rhodesia, in 1896, during the Second Matabele War. 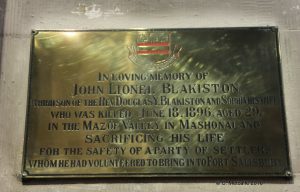 Sacrificing his life for the safety of a party of settlers whom he had volunteered to bring in to Fort Salisbury. 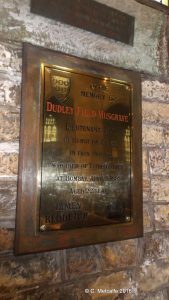 The Blakiston shield is at the top of the plaque, with its motto: Do well and doubt not. St Swithun’s has reminders of young men killed far way, serving their country- in Pretoria, Bombay and Zimbabwe, in conflicts often forgotten now, as well as Major Musgrave who fell in France in the last year of the Great War, and all the others of the parish who fell in both World Wars. 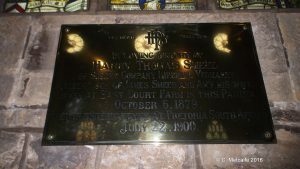 Remembrance is etched into the fabric of the church.